Experience the best of Namibia in this highlights package. An adventure tour that begins with an exciting Safari in Etosha National Park - Namibia's premier game reserve. Fantastic wildlife viewing, including predators and huge herds of elephants. 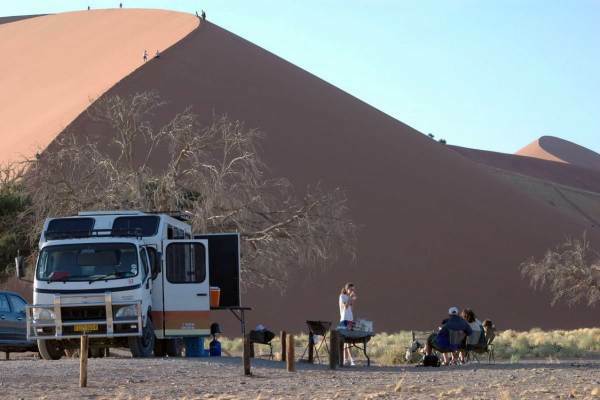 This is followed by a trip to the oldest Desert in the world, breathtaking scenery in Sossusvlei and Dead Vlei with spectacular sunrises and sand dunes awaiting. Our Etosha camping safari begins in Windhoek, and we head north through farmland and rural Namibia. Etosha National park is home to a large variety of wildlife and is one of Southern Africa’s premier safari destinations. We arrive at Etosha mid-afternoon and enter the park from the west. We drive through to our camp – Okaukuejo. After establishing camp we have an early dinner and clients are then encouraged to go the local waterhole. This waterhole is floodlit and famous for its constant stream of wildlife coming to drink. Elephants, rhino, lions, zebra, antelope and giraffe are regular visitors. Our safari continues with an early morning start. We enjoy the cool of the morning as we go from waterhole to waterhole. One can expect some fantastic animal sightings – have your cameras ready. We visit the famous and massive Etosha Pan. We have a welcome rest at Halali camp – situated in the middle of the park. One can relax, have a swim in the pool, visit the waterhole or take advantage of the facilities. We head further east to our camp at Fort Namutani. Etosha National park is home to a large variety of wildlife and is one of Southern Africa’s premier safari destinations. After breakfast we exit the park on the west side and begin our journey back to Windhoek. Driving through the sparsely populated rural areas, we stop at the popular Okahandja wood craft market for an opportunity to browse and purchase curios. The Etosha segment of our camping safari ends in Windhoek in the late afternoon. Our adventure continues with an early morning departure as we head for the Namib Desert. We travel through farmlands and pass over the Naukluft Mountains. We pass the desert town of Solitaire and head for our camp located in the red sand dunes of the Namib Desert. We enjoy a sunset over the desert. We begin our day pre-dawn so as to capture the spectacular sunrise over the desert. The shifting shadows and changing light over the dunes creates amazing contrasts and is a photographers dream. 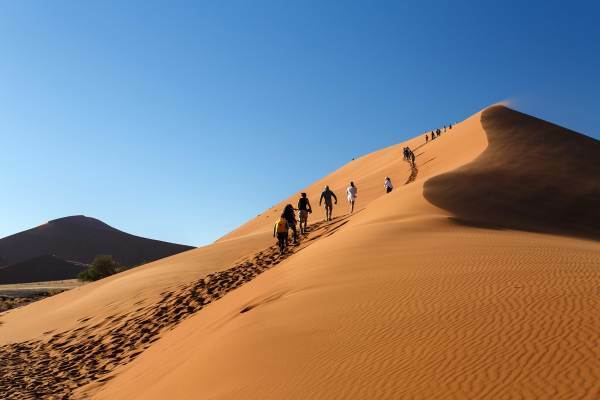 We trek through the desert to Soussusvlei, taking in the incredible dune formations. A walk across the pan of Deadvlei is a must with its ancient thorn trees and dunes. After soaking up the desert we head towards camp, with a stop at the massive Dune 45. The brave may want to attempt the summit. In the late afternoon we visit Sesriem Canyon. Dinner under the desert stars. After breakfast and we begin our journey back to Windhoek. We follow a different route crossing mountain ranges and rural Namibia. We expect to arrive back in Windhoek in the late afternoon where our tour of Namibia comes to an end.